I dropped my iPhone today. The scratches are on 3 of 4 corners of the phone... see below. Not only did I dropped it, I let it bounce and tumbled several times before resting face down the concrete floor. It never fails, whenever I drop my mobile phone, it's always when I'm on the run. You see, when I'm running, it creates additional momentum when the phone lands on the ground. So, the damage is more severe. When I was using my Blackberry 8700C I used for SAG, I was running to the elevators from the garage, and it literally drop with a thud and slid across the floor 35-40 ft at approximately 10 mph. 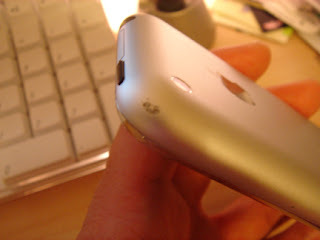 During it's journey across the floor, it picked up debris, dirt and crud which left permanent scratches on the phone. I later had to replace it with a newer BB 8800. Yep, you guessed it... within 2 weeks, I dropped it while chasing a subway car when I was in NYC in April for my 25th High School Reunion. So, again, within 3 weeks, I dropped my iPhone. Aargh!! The darn Griffin holster broke on me. Do not make the same purchase becuase wen the clip broke off, it launched my iPhone in flight. Save your $$.